It won’t be long before buds begin to wake up and green sprigs of grass will start to peer through dormant winter grass. Unfortunately, though, that also means time to watch for early spring weeds to start popping up. Today, we’ll cover a 3 common early spring weed to watch for, and most importantly, how to control them. Dandelions are the most commonly known and recognized in lawns. They are also quite stubborn. The perennial produces a rosette of tiny laves close to the ground surface and grows long taproots which make them difficult to remove from the ground. By the time you see a dandelion, it’s well established, which is why it seems you’ll never rid yourself of them. 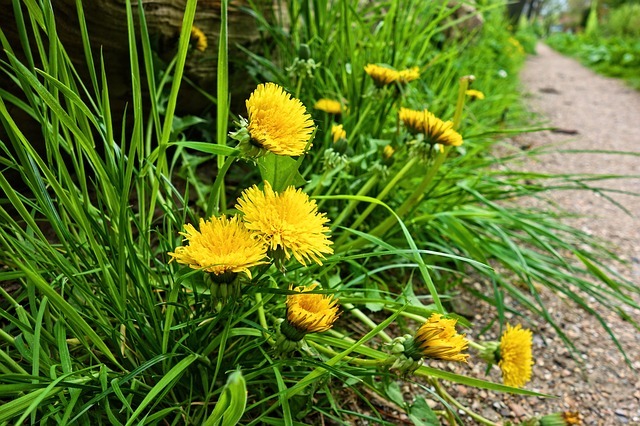 Check out this step-by-step guide on removing dandelions from your lawn. White or Dutch Clover is one of the most common weeds of turfgrass. You can identify it by its white-banded leaves and a tall, slim stalk topped by a white or pink flower that attracts bees from May to October. White clover is aggressive and sends out runners all over lawns and fields, causing a die-off of grasses. Other names you may recognize are honeysuckle clover, white trefoil, or purple grass. Control clover by either pulling it out by hand or using a herbicide. For more information, check out this resource. Hairy Bittercress is a weed that produces tiny white flowers at the ends of the stems and then turns into long seedpods. These pods split open explosively when ripe and fling seeds out into the environment. This pesky weed is small enough to hide among your landscape plants. Its extensive seed expulsion means that just one or two weeds can spread quickly through the garden in spring. Early control for hairy bittercress is essential to protect the rest of the landscape from an infestation. Read more about this weed here. Control common early spring weeds by hiring Nichols Reliable Lawn Care Service to maintain a beautiful lawn. Call us today at (479) 502-2192 for a free estimate. Was this article helpful? Please share it and help others identify early spring weeds.